Bus from Alor Setar to Kota Bharu is the most convenient and cheapest mode of transport for locals as compared to budget airline service. Not only locals, many travellers also prefer to take bus from Alor Setar to Kota Bharu in order to have the chance to enjoy the beautiful scenery along the route. 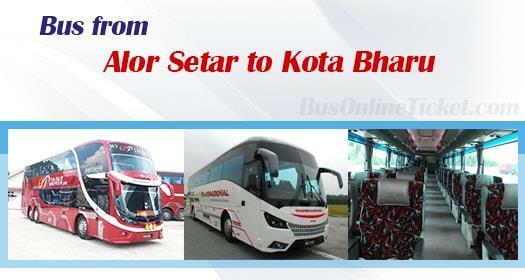 Even though flight is the fastest transport to travel from Alor Setar to Kota Bharu, bus is still the popular option to travel between Alor Setar and Kota Bharu. There are few reasons. First bus is always cheaper and more comfortable than flight. Second, flight between Alor Setar and Kota Bharu is not direct flight. Passengers are required to have a transit in Kuala Lumpur Airport. Perdana Express and Transnasional are the only two bus operators providing bus service from Alor Setar to Kota Bahru. There are only 2 departures daily from service providers with one in the morning about 10am and the other one in the evening 10pm. Perdana Express deploys double deck VIP bus for this bus route while Transnasional deploys single deck VIP bus. The duration required for bus from Alor Setar to Kota Bharu takes about 7 hours depending on traffic and climate condition. The bus fare is about RM 38.90 depends on the choice of bus operators. The boarding point in Alor Setar is located at Alor Setar Bus Terminal. The arrival point in Kota Bharu is located at Kota Bharu Bus Terminal. Washroom break will be provided during the journey because all buses in Malaysia has no toilet in the bus. By booking your bus ticket with BusOnlineTicket.com, you can enjoy the convenience of our online bus ticket booking service. It's easy, quick, and secure to book your bus ticket online via BusOnlineTicket.com. You can now book your ticket and make your payment securely at anytime, anyplace, anywhere through BusOnlineTicket.com!